The purpose of a complete diagnostic hearing assessment is to determine if a hearing/medical problem exists. If it does, appropriate recommendations for medical referral, further testing, hearing aid use, assistive listening devices or other options will be discussed. Professional evaluations using sophisticated testing equipment are an important first step to improved hearing. At Audiology Associates, Inc. we test people of all ages, from newborn to seniors. Fortunately, most people with hearing loss can benefit from hearing aids. If you are one of them, we will help you with proper selection and fit. We will also document our findings with a report to you and your primary doctor. We are one of the select few in the country now doing non-sedative Auditory Brainstem Response (ABR) testing. The ABR test is a measurement of how the brain reacts to sound and to determine how well sound travels along the auditory nerve pathways from the ear to the brainstem. A computer analyzes changes in brain waves in response to the sounds. This technology is perfect for infants, children or any patient who is difficult to test or who cannot be evaluated by traditional hearing tests. In adults, ABR can identify central nervous system lesions (tumors), such as auditory neuropathy and auditory dys-synchrony, which are not detectable by MRI. It’s also helpful in differential diagnosis of patients with dizziness. 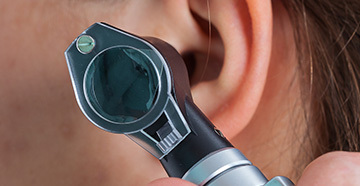 VNG testing is considered the new standard for testing inner ear functions over Electronystagmography (ENG) because VNG measures the movements of the eyes directly through infrared cameras instead of measuring the mastoid muscles around the eyes with electrodes like the previous ENG version. VNG testing is more accurate, consistent, and comfortable for the patient. VNG testing is used to determine if a vestibular (inner ear) disease may be causing a balance or dizziness problem, and is one of the only tests available today that can decipher between a unilateral (one ear) and bilateral (both ears) vestibular loss. VNG testing is a series of tests designed to document a person's ability to follow visual objects with their eyes and how well the eyes respond to information from the vestibular system. We provide consultative industrial services including but not limited to, sound level surveys, industrial hearing testing (on or off site), and custom and non custom ear protection. 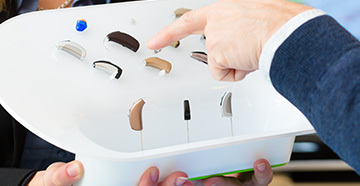 Hearing aids have come of age...with high tech advancements that will surprise you. 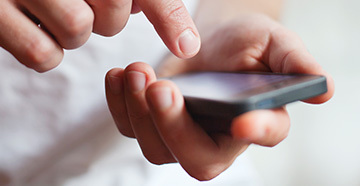 Overall, digital hearing aids are more effective, more comfortable and easier to use than ever before. But no one hearing device is right for everyone...That is why we work with you to help find the instrument(s) best suited to your needs. We carry a full selection, including "canal", "in-the-ear" and "behind-the-ear" models. As a clinical test site for newly developed hearing products from major manufacturers, we are able to offer the most advanced instruments before they are on the market. We offer comprehensive service of your hearing aids using the most advanced digital analyzer to determine what problems may exist, as well as routine in office cleaning and maintenance. Repairs are sent directly to the original manufacturer to ensure the highest quality repair work. We offer a variety of earmolds and earpieces for noise protection, swimming, music, I pod and cell phone use. Specialized ear protection for hunters, musicians and pilots are also available. We carry a full line of batteries. We offer a small 4 battery package or an economical 48 battery package. Coming soon our battery club, ask us about it. We will also recycle your used batteries through the Vermont Health Care Association Button Cell Battery Recycling Pilot Project.